WHAT IS ACRYLIC FACE MOUNTING? Acrylic face mounting in my opinion is the Rolls Royce of photo presentation. It's sleek modern look puts to shame the tired old wooden frame. Sometimes referred to as "float frames" they sit off the wall and appear to be suspended in mid air about an inch from the wall. The photo is sandwiched between a piece of Acrylic approximately 4-6 millimetres deep and a backing piece of aluminium or PVC. This backing gives rigidity to the mount and stops the acrylic curving or bowing. It also helps to block light coming through the back of the photo and revealing the hanging system when viewing from the front. This frameless presentation combined with a high gloss or metallic paper is exceptional. It provides a shiny almost wet look to the photo and is guaranteed to captivate the viewer. With the image mounted behind the acrylic, light refracts in such a way that makes the color pop and provides a near 3-D effect. With proper lighting, it almost appears as if the piece is illuminated from behind. This can not be achieved with direct printing or glass in traditional frames. 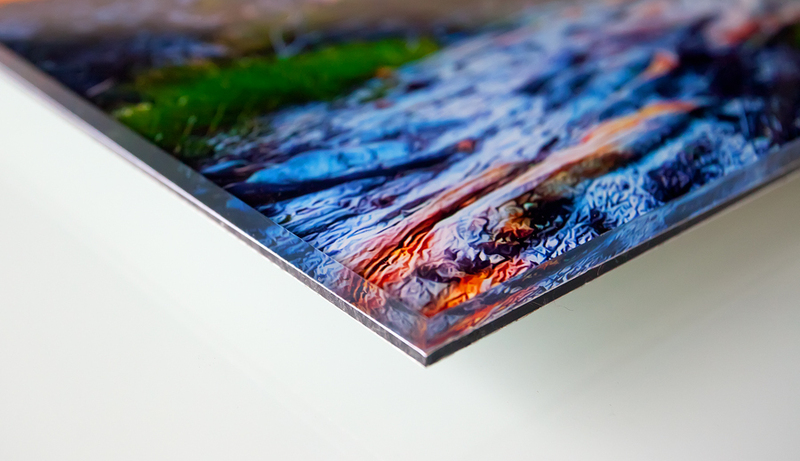 At large sizes and further enhanced by printing on metallic paper, an acrylic face mount is unparalleled in the ability to provide that “wow” factor. It truly adds value to an image that traditional frames and canvas prints can not. When light hits the layer of acrylic, the reflection on the prints surface is completely different from when a print is framed with general-purpose glass. With this unique production method the 'depth' and colour saturation of the image is optimised due to the clarity of acrylic glass. As a result the colours seem more brilliant, intense and direct, bringing a whole new dimension to the print.